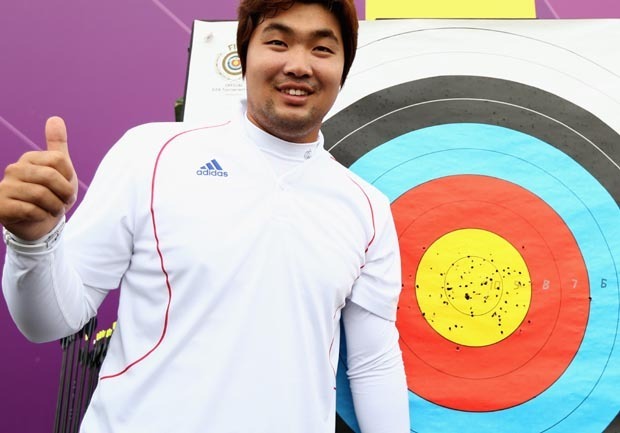 (AP) LONDON - Legally blind archer Im Dong-hyun set the first world records of the London Olympics, breaking his own record in the 72-arrow mark and helping South Korea set a team record during Friday's ranking round. Im broke the 72-arrow record he had set in Turkey in May by three points with a score of 699, hours before the 2012 Games official opening ceremony. Despite the success, Im was modest in his reaction. "This is just the first round, so I will not get too excited by it," he said. Team coach Jang Young-sool said the team would rest up for the remainder of the day and prepare for Saturday. Im, 26, won gold medals in the team event in both the Beijing and Athens Olympics. He has only 10 percent vision in his left eye, and 20 percent in his right, meaning he is considered legally blind. He has said that when he looks at the targets, he sees colors with blurred lines between them. He does not wear glasses in competition, saying he relies on being able to distinguish between the bright colors of the target. Any spectators hoping to catch a glimpse of the action left angry and confused after being turned away from Lord's cricket ground where archery is being held. Preliminary rounds were listed as non-ticketed and several thousand spectators showed up at the venue expecting to get in for free.